Puntas Surf School is a family owned and operated business located in the surfing capital of the Caribbean, Rincon, Puerto Rico. The owner, Melissa Taylor, is a life-long surfer who channeled her love and passion for the sport into the creation of Puntas Surf School. Melissa is the longest-standing surf instructor in Rincon, having started giving lessons there more than a decade ago in 2002. She created the official business name in 2007 and was joined shortly after by her now-husband Nolan. Melissa, Nolan and the rest of the Puntas Surf staff are all experienced surfers and teachers, well-traveled, personable, and have been surfing in Rincon and the surrounding areas for years. This gives them an intimate knowledge of the breaks with their diverse swells, wind conditions, and reef bottoms. The Puntas Surf team emphasizes hands-on lessons with their clients with a 2-to-1 student/instructor ratio and a large variety of boards for clients to choose. They offer lessons for a wide variety of experience levels, as well as surf packages and surf board and paddle board rentals. Open seven days a week year-round, they are happy to work with students' schedules to best accommodate their needs and availability. What sets them apart from other surf schools, is there experience in the water, with and without students; their flexibility and their soul-surfer mentality. They truly enjoy showing people from around the world their fountain of youth. They are pure and simple surfers, eager to share their passion and their knowledge of the ocean to others from all walks of life. Come and learn to shred with us! Learn to surf in Puerto Rico from the best instructors in Rincon! Our instructors have had the privilege of helping countless first-timers catch waves and ride them as long as they go! Rincon is a perfect place to learn to surf and we know just where to go. We perform a full orientation and practice exercises on our own private chunk of the beach and then go to where the waves are best for your lesson. We also work with those who may have some experience with surfing, but would like to improve their technique and benefit from our local knowledge. Our goal is help you have the best surf session possible. Please visit our website for more details on Rincon Paddle Boards! 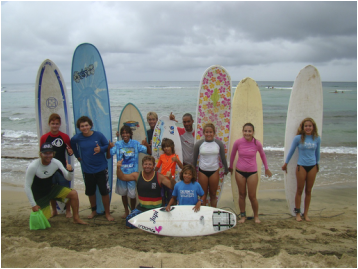 Surf 787 Surf School operates year round and offers instruction for both adults and kids of all ability levels. Safety is our primary focus and therefore our group lessons are limited to a maximum of three students per instructor. Surf787 offers private, semi-private (2 students) and small group lessons (3 students). All our instructors are CPR certified and encourage students to enjoy their learning experience and have fun. For more experienced surfers who may be unfamiliar with the numerous surf spots in the area, we offer a surf guiding package on a daily or half-daily basis. Our surf guides know where the best waves are breaking and will take you to locations appropriate for your level of expertise. If you'd like to immortalize your finest surfing moments we can also arrange for a professional photographer to capture you riding the waves. In addition to surf instruction Surf787 offers surf board rentals - soft boards, long boards and short boards are all available to rent. Surf787 is the new dealer for Hobie SUP, surfboards and sailboats in the west cost...Our surf school is renting SUP. You can rent a demo boards...free drop off and pick up in Rincón.